The big idea the architect brought to this project was to put a spiral stair in the apse to connect the main level with the lower level. 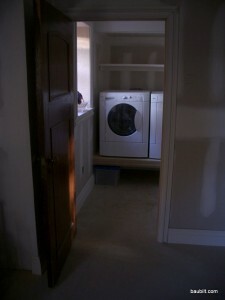 Furthermore, there would be a door out to the back yard halfway down the stair off of a landing. Here are some shots of how we did that. 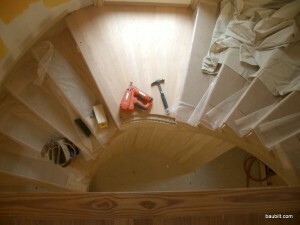 A custom curved stair manufacturer Stairworks built and installed the basic stair and rail. They did a nice job…actually they did a nice job twice. They messed up a measurement the first time and had to completely rebuild it. To their credit, they didn’t even blink and just did it. The landing of the spiral stair. I had Bernie make the floor boards fan shaped, which really seems like the way to go for this shape. 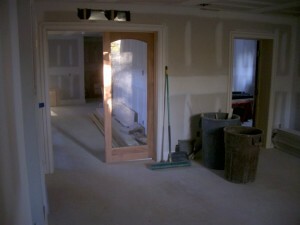 Most of this project focused on the lower level. 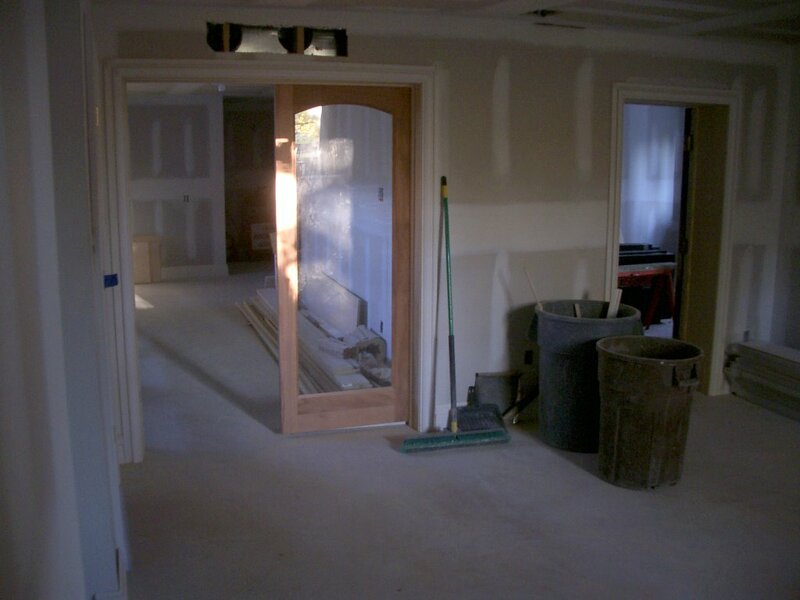 However, because the spiral stair connected the lower level with the main level, we had to do a fair bit of work in the kitchen/dining area. I had done a “quick and dirty” kitchen renovation a few years ago myself and decided that it was good enough to leave in place. 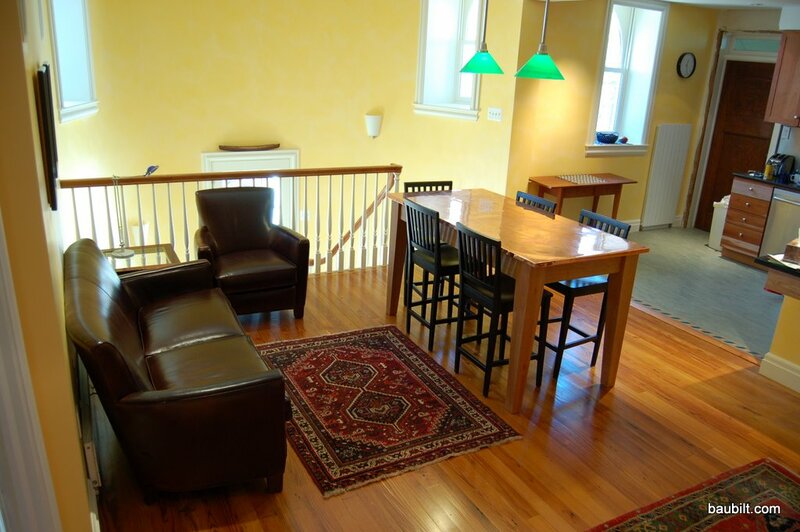 Thus, we mostly confined the main-level effort to the stairwell/apse area and the resulting open dining area adjacent to the kitchen. I’ll start with how it ended up…and then show some of the steps. The finished kitchen/dining area facing towards the spiral stair. 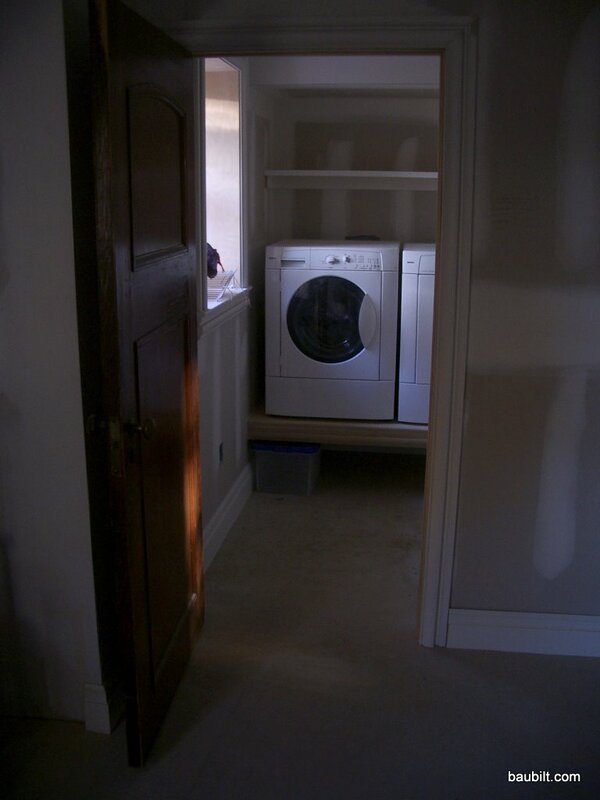 Shelf for front-loading washer and dryer. I like this solution better than the modules the manufacturers sell. This shelf allows laundry baskets to be tucked under.